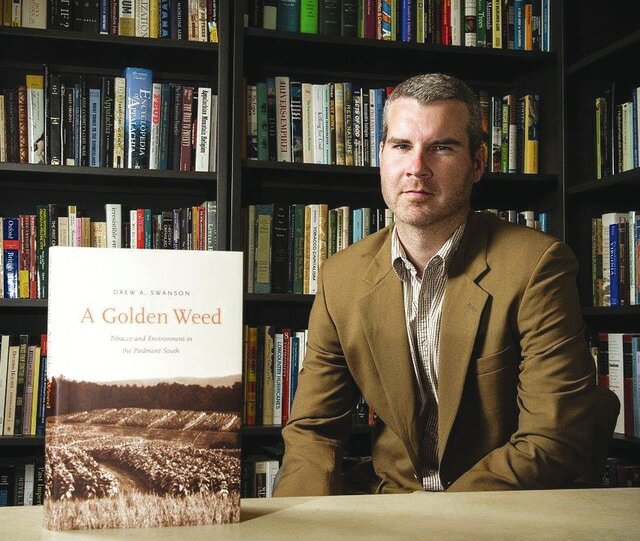 Photo courtesy of WSU In “A Golden Weed,” Wright State professor Drew Swanson unearths the history of the Piedmont region of Virginia and North Carolina and how it went from a wealthy, tobacco-farming region to a largely impoverished landscape and population. FAIRBORN – The seed was planted with the boy during a walk through the woods on his grandparents’ Virginia farm. A deep gully in the red clay that cut through the pines was a telltale sign of careless tobacco farming on fragile soil. That early memory for Drew Swanson, Ph.D., now an assistant history professor at Wright State University, grew to a gnawing curiosity about the history of tobacco growing and how its successes and failures came to shape his boyhood home. And that curiosity has produced “A Golden Weed: Tobacco and the Environment in the Piedmont South,” named by the Agricultural History Society as the year’s best book on agricultural history. Swanson grew up on a small farm near Roanoke, Virginia. His father still farms and also works as a Southern Baptist minister and semi-retired high school English teacher. Swanson was initially interested in a career in forestry or the outdoors, so he got his bachelor’s degree in biology from Lees-McRae College in Banner Elk, North Carolina. After graduation, he worked as a park ranger at Grandfather Mountain, which is part of the Blue Ridge in North Carolina. So Swanson decided to return to academia and got his master’s degree in history from Appalachian State University and his Ph.D. from the University of Georgia, where he studied environmental history. “A Golden Weed” sprang from Swanson’s dissertation at Georgia and his postdoctoral fellowship at Millsaps College in Jackson, Mississippi. Swanson wanted to unearth the history of the Piedmont region of Virginia and North Carolina to figure out how it had gone from a wealthy, tobacco-farming region to a largely impoverished landscape and population. While Bright Leaf performed well in soil whose fertility had been significantly depleted by previous tobacco varieties, the soil continued to erode. And by the time farmers began relying on synthetic fertilizer in the late 1800s, it was too late. Swanson began research on the book in 2006, looking for answers in archives, microfilm, book collections, letters, diaries, daybooks and farm journals. Swanson was surprised at how much money could be made by growing tobacco. One newspaper even put a local farmer’s big tobacco crop on the front page and buried on Page 2 the historic news of John Brown’s raid on Harper’s Ferry, an attempt by the white abolitionist to start an armed slave revolt by seizing an arsenal. “This is a story of the rise of a crop culture, but it is also a tale of the decline of the environment that accompanied this form of tobacco cultivation, from severe erosion to deforestation to insect infestations,” Swanson writes. In addition to the Agricultural History Society honor, Swanson won the Ohio Academy of History’s 2015 Publication Award for junior faculty at Ohio universities. Swanson said he hopes the book is a lesson for the future.